6 Rare Recordings, Including Hitler's First Radio Address Where he Chillingly sets out his Vision for a New Nazi Germany. Following a meteoric rise to prominence, Adolf Hitler was asked by President Hindenburg, on January 30th 1933, to become Germany's new Chancellor, believing the power, of high office would rein in his more extreme policies. But within a short space of time his Nazi Party would control every aspect of German life, including the Armed Forces, for the next 12 years. 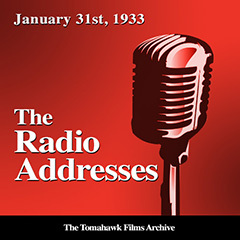 Recognising the power of radio, Hitler wasted no time in reaching out to the German people and on January 31st 1933, the day after assuming power as Reichskanzler, he made his first national address. Tomahawk Film Music found two shellac 78 rpm records lying in an archive in Southern England in the summer of 1998 and when the film company's producer, Brian Matthews, played back those old records he was surprised to find they contained, not Nazi Military Music as expected, but Hitler's very first broadcast - and this is that broadcast! Accompanied by 6 rare recordings of the Musikkorps der SS-Leibstandarte 'Adolf Hitler', including Deutschland Waffenehre - Argonner-Marsch - Grosse Historische Marsch and Deutschland uber Alles, Hitler chillingly sets out his vision for a new Nazi Germany. A totally unique recording, this is Adolf Hitler at his most relaxed, giving the listener a real image of the man, long before the days of his later staged and very well-known 'theatrical rages' for the benefit of the cinema-newsreel cameras and the Party faithful..! Now digitally re-mastered by British music industry engineers and released for the very first time on CD by Tomahawk Film Music, this incredible Adolf Hitler's address to the nation comes complete with both a faithfully printed German transcript and its complete English translation, so offering a full and fascinating understanding of this most famous of all his speeches to the citizens of the Third Reich!.